Each member of AUBG community should report to Facilities of all noticed damages and problems with the electric, water and sewerage systems of the University as well as of any broken or damaged property. Each repair request is submitted in a written form via electronic mail to any of the Facilities staff or to the office email address – facilities@aubg.bg, and via specialized Repair Request system at http://repairs.aubg.bg. Upon submission to the repairs request system, the individual receives an email with confirmation of the request. Students also may use the notebooks at the reception desks of the residence halls to list the repairs needed. The submitted repair request is received directly in Facilities office and is assigned to the respective service group. At the same time the deadline of the repair is defined. Upon completion of the task the Repairs and Renovation Supervisor enters the date of completion and the name of the staff member to whom the repair was assigned into the system. The individual who submitted the repair request received an automatic reply regarding this completion and can rate the performance. Each member of AUBG community may book a classroom or any other facility of AUBG for purposes related to the educational process and student life on the “first come, first serve” basis. The reservation can be requested with an e-mail or phone call to Facilities Office (extension 324, office 106A, Main Building). The students willing to use any of AUBG facilities shall obtain permission from their faculty advisor/supervisor. First priority at room reservation is given to faculty in the cases when the reservation of the facility is directly related to classes (mid-term exam, quizzes, make-up sessions, etc.). The reservations are marked in the Outlook Public Folder Calendar by the authorized officers at Facilities and Faculty offices. 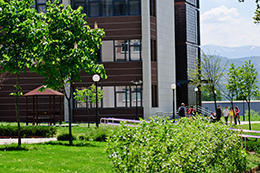 The renting of AUBG premises by outside customers is possible through the office of “Conferences and Institutes and External Events” and the rent for it is paid to the Business Office. The booked AUBG classrooms or other facilities are used “as they are”; each rearrangement of the space shall be performed by the user and the users shall be obliged to rearrange to space back in the initial setting after the event is over. If additional manpower for the rearranging of the space is needed, the Facilities Office may provide it for a fee in accordance with an approved tariff. The renting of “wall space” for exhibitions is possible through the University Events office. Ongoing maintenance repairs and renovation are performed each summer season. Repair schedules are planned after the completion of the school year and take into consideration the scheduled summer events such as summer camps, sporting events, and others. Detailed information of upcoming events is requested well in advance, and meetings with respective officers and managers are held to create the best organization of utilization of the campus facilities and avoid overlapping events with construction works. Facilities Office prepares bills of quantity for the forthcoming construction and renovation works for the common parts of buildings, their roofs, and their facades on campus. Before announcing the procedure Facilities Office shall inform the budget managers about the forthcoming repairs. If necessary, Facilities Office shall assists them to calculate the estimated cost of repair and preferred building materials. By the end of April the budget managers shall send feedback on necessary repairs and determine the cost center to be charged. The advertising of the renovation works is performed after a Bill of Quantities for different types of works has been produced. i. Membership Certificate from the Chamber of Construction (recommended). The main criterion for awarding the construction and renovation works is the cost of works. The lowest cost is the most important in selection of candidates. A Committee, appointed by the Vice President for Finance and Administration reviews, evaluates and selects a Contractor. A Contract for execution of construction and renovation works is signed with the finalist of the tender. Execution of work, supervision, and acceptance activities. The contractor shall carry out their repair work in time and in a qualitative manner, observing the necessary technological and regulatory safety rules. Payments under the contract shall be made after signing the bilateral verification protocols stating the definitive completion of activities in different stages and works upon presentation of appropriate invoices. The warranty period for all types of construction works shall be in accordance with ordinance for commissioning buildings in the Republic of Bulgaria and the minimum warranty periods for completed construction works, equipment and construction for the objective five years, and shall become effective from the date of signing the verification of completion of construction works. The control over the construction and renovation works shall be performed by the authorized personnel of Facilities Office – Director, Supervisor of Construction, Repair and Maintenance Services, and Employer’s Supervision. The Certification of completion for each type of work is performed by the Designer/Architect (Engineer), Construction Supervision Company and the Contractor in accordance with the design, Financial Plan and Technical Requirements and Norms. The Construction Company shall present a Bank Guarantee for Proper Performance, a Bank Guarantee for Advance Payment and a Bank Guarantee for the Warranty Period during the consecutive stage of construction. Electric and plumbing services are outsourced; please, contact Facilities Office for assistance.